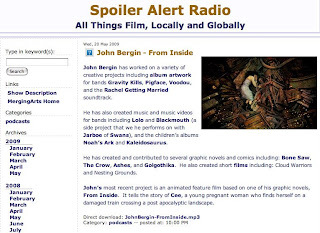 A few weeks ago I had the pleasure of being interviewed by Toni Pennacchia for Spoiler Alert Radio. My speaking skills for the interview were approx. 2 cups of coffee to the wind (ie: depressed-sounding, but with lots of words -- it takes about 4 cups to make me sound like I’m not talking from under a dark staircase). I had fun talking with Toni and I encourage you to page back through the Spoiler Alert archives and listen to her other interviews. I’ve discovered some great work there!